Today’s healthcare landscape is ever evolving, and ambulatory care facilities play an essential role in this change. These centres are emerging at leading hospitals throughout Canada, serving a progressively vital role in healthcare delivery. The facet of urgent care is constantly shifting and modern facilities cater to these demands, bringing improved access to services, improved patient experiences, and improved use of healthcare resources. Modern ambulatory care facilities allow care providers to offer a high level of care to patients in a constantly busy and pressured environment. The New Oakville Hospital, for example, will host an expanded ambulatory care facility, offering specialized care through a number of specific departments, including an eye clinic, fracture clinic and medical day care and clinics. The key focus of ambulatory care is to address the growing demand for a broader range of same-day health services. In ambulatory care, patients do not stay overnight. These facilities are designed strictly for outpatient treatment. When I first began working in hospital care over 20 years ago, ambulatory care was provided in small departments, such as exam rooms and consultation rooms. Due in part to economic constraints, healthcare providers have now become more focused on treatments and programs that support patients on an outpatient basis. Patients are treated in the facility and then discharged the same day. It’s almost like a glorified doctor’s office. More recently, we have also shifted the focus to place a heavy emphasis on prevention. Modern facilities are designed to meet current infection-control standards through improved design of spaces and increased private rooms. In addition, some of our ambulatory focus is now directed at health and wellness. For example, patients suffering from chronic disease can meet with a counselor in an educational setting to learn how to manage the illness. It’s important for these facilities to be designed to improve the efficiency of staff and quality of care provided. This means using a generic layout in all of the exam rooms, so clinicians can move from department to department and always know where everything is. 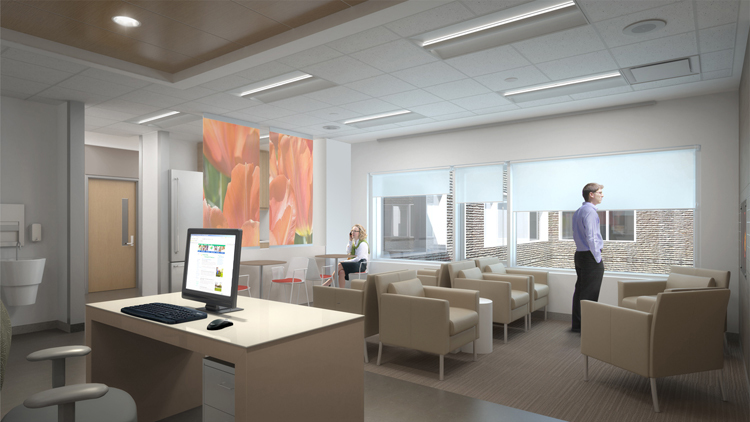 We also want to keep the exam rooms generic so they can change with time; ambulatory care has evolved so quickly in terms of the different types of treatment provided, and we want to ensure the rooms are universal rather than strictly serving a specific function. Ambulatory falls under Group D Occupancy, meaning that design requirements are not as stringent as those in a hospital setting. For example, ambulatory care corridors are required to be a minimum of six feet wide. To ensure adequate clearance for movement of stretchers in case of an emergency, Parkin’s ambulatory designs adhere to the hospital corridor requirement of eight feet wide. This measure provides for higher levels of acuity and wider flexibility for future changes and future uses. We always design with the future in mind. A key factor in any health facility is an ambience that is welcoming and comfortable for patients. This means that the facility does not look or feel like the cold, clinical setting of the past. Our designs create a secure, restful, family-centered environment by maximizing use of natural light, avoiding monochromic schemes when selecting furniture, providing soothing artwork and using warm accent colours to create cozy and inviting spaces.